Pictured here is Moses Dickson, from the frontispiece illustration of the 1879 book A Manual of the Knights of Tabor and Daughters of the Tabernacle. In 1872, the Rev. Moses Dickson founded the International Order of Twelve of Knights and Daughters of Tabor, an African-American fraternal order focused on benevolence and financial programs. 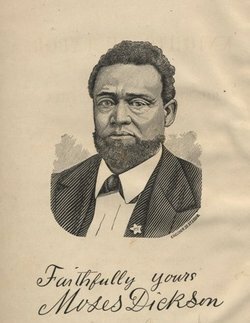 Dickson was born a free man in Cincinnati in 1824, was a Union soldier during the Civil War, and afterwards became a prominent clergyman in the African Methodist Episcopal Church. Dickson showed an interest in progressive fraternal organizations early on - in 1846 Dickson, with others, founded a society known as the Knights of Liberty, whose objective was to overthrow slavery; the group did not get beyond the organizing stages. Dickson was also involved in Freemasonry - he was the second Grand Master of the Prince Hall Grand Lodge of Missouri. Dickson's International Order of Twelve of Knights and Daughters of Tabor - or Order of Twelve, as it's more commonly know - accepted men and women on equal terms. Men and women met together in higher level groups and in the governance of the organization, although at the local level they met separately - the men in "temples" and the women in "tabernacles" (akin to "lodges" in Freemasonry). The Order of Twelve was most prominent in the South and the lower Midwest. The major benefits to members - similar to many fraternal orders of the time - was a burial policy and weekly cash payments for the sick. What many people today remember about the Order of Twelve is an institution founded in Mound Bayou, Misssissippi in 1942 - the Taborian Hospital. Michael Premo, a Story Corps facilitator, posted his appreciation for the impact that the Taborian Hospital had on the lives of African-Americans living in the Mississippi Delta from the 1940s-1960s. The Taborian Hospital was on the Mississippi Heritage Trust's 10 Most Endangered List of 2000, and an update to that list indicates that the hospital still stands vacant and seeks funding for renovation. Here are some photos of the Taborian Hospital today. Dickson, Moses. A Manual of the Knights of Tabor and Daughters of the Tabernacle, including the Ceremonies of the Order, Constitutions, Installations, Dedications, and Funerals, with Forms, and the Taborian Drill and Tactics. St. Louis, Mo. : G. I. Jones [printer], 1879. ----. Ritual of Taborian Knighthood, including : the Uniform Rank. St. Louis, Mo. : A. R. Fleming & Co., printers, 1889. Beito, David. From Mutual Aid to the Welfare State: Fraternal Societies and Social services, 1890-1967. Chapel Hill, N.C. : University of North Carolina Press, 2000. Skocpol, Theda, Ariane Liazos, Marshall Ganz. What a Mighty Power We Can Be : African American Fraternal Groups and the Struggle for Racial Equality. Princeton : Princeton University Press, 2006. Hi I have a copy of the hard cover of the Ritual of Taborian Knighthood, including : the Uniform Rank. St. Louis, Mo. : A. R. Fleming & Co., printers, 1889. I wanted to learn more about it. Great Great grandmother born in 1907 had it in her belongs as we are going through it now. Is this book a hard find? I have a pretty old book that bears this name. Thanks for reading our blog. According to the 1889 ritual, it stood for “Uniform Knight of Tabor,” or “Uniform Knights of Tabor,” which is a reference to the organization’s fourth degree, called “The Uniform Rank.” The description of the “full dress uniform,” which is noted as used “for public turn-outs” of Uniform Rank members, includes a description of “a shield of yellow metal, with letters U.K.T.” which would have been worn on the dress coat. The description of the dress uniform is similar to that of a Masonic Knights Templar uniform, or other quasi-military uniform. Do you know what the UKT stood for on their medal? I'm glad you liked the story - and thanks for pointing out the typo so that I could fix it! Check the spelling of Mississippi in the link, "Missississippi Heritage Trust's 10 Most Endangered List of 2000."